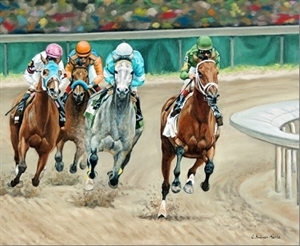 Description Gallery at the Brown presents "Furlongs," this year's Kentucky Derby art show, featuring artists Kevin Oechsli, Jaime Corum and Carole Andreen-Harris showing March 25 through May 31. Gallery at The Brown features local artists to bring awareness to Louisville’s visual arts scene. It is located on the first-floor of The Brown Hotel. The gallery is open Monday through Friday from 8 a.m. to 9 p.m. and 9 a.m. to 8 p.m. on Saturday. Add Derby Art Show to your free online travel itinerary.